Whenever it seems that Capcom has run out of strange things to brand with the Sengoku Basara characters, a new listing appears online to prove that there are always more merchandise opportunities out there. The latest preorder pages I've found are for four different traditional cotton noren curtains to brighten up homes across Japan. 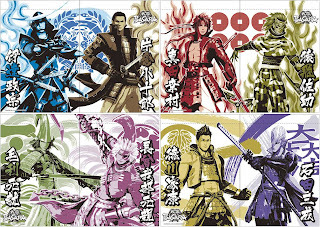 For ¥2,800 fans can choose between Masamune/Kojuurou, Yukimura/Sasuke, Motochika/Motonari or Ieyasu/Mitsunari designs. Noren are actually surprisingly common when it comes to historically-themed merchandise. I remember that the souvenir shop at Shiroishi Castle had a wide range on offer decorated with Sengoku-era kamon crests and the livery associated with the Date family. You never know; loyal Sengoku Basara fans might have been waiting for these for a long time! While it's not as lengthy and difficult-to-read as my own article, Anime News Network has just posted an excellent review of the US Blu-ray/DVD release of Sengoku Basara -The Last Party-, the movie which ended the Sengoku Basara anime series. I recommend taking a look if you haven't tried the anime yet, especially as most western DVD reviews seem to miss the point of the Sengoku Basara world by a long way and end up moaning about the very things which make the series so great. Kudos to ANN for using a reviewer who understood what the anime was trying to do! 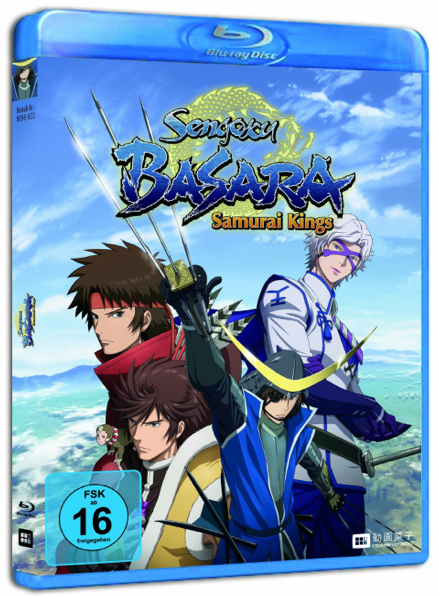 It's been a while but it seems that Germany is finally going to get a localised home video release for the Sengoku Basara anime! I'm delighted for them; my own fandom today owes a lot to the German anime industry so it has a special place in my heart. Strangely, the cover artwork for the first season features Hanbee, who doesn't appear at all in those episodes. It would have been a more appropriate cover for season two.